A sizable crowd gathered Monday morning in Faribault’s Central Park for the annual Memorial Day program. FOR ME, PHOTOGRAPHING any place or event is about the details as much as the whole. Details are like words, which when strung together, create sentences and then a story. Details are as precise as the properly placed gloved hands of a veteran. On Memorial Day at Faribault’s Central Park, details were written into the annual post parade ceremony honoring our veterans and war dead. Veterans dressed in pressed uniforms, formal in attire. Crisp. Snap. Salute. Precision marked their movements. Such formality evokes evidence of honor, most suitable for this occasion. A veteran plays taps at the conclusion of the program. Taps mourned and guns fired. Flags rippled. Protocol held utmost importance. A patriotic cap hangs from a bicycle. Dressed appropriately for Memorial Day. And in the audience I observed a dress code of patriotic reverence for this day. Red, white and blue prevailed. I noticed even the flag on the back of this man’s cap. A child waves a flag. Nestled on his grandpa’s lap, this young boy holds an American flag. American flags, too, were noticeable. Wreaths placed on and below the cross represent the wars in which the U.S. has been involved. On occasions like this, I feel a deep sense of pride that my community cares enough about those who have served to present, participate in and attend a Memorial Day program in the park. Veterans walk through the crowd after advancing the colors. We care about this great nation of ours, about our freedom, about our family members and others who have served in the U.S. military. A member of the honor guard. I noticed a poppy pinned to a veteran’s uniform. I am grateful to live in this country, grateful to gather in a city park, grateful to have the uncensored freedom to photograph the details, to document this event in images and words. One day, if you’re lucky, you’ll get to be old. That single statement from the FaceAgingMN website emphasizes the positive side of aging. If we weren’t getting older every day, well, we wouldn’t be here. I remember how, when I turned 40 years old, I lamented that I was so old. My friend Jenny reminded me of the alternative. That put everything in perspective. Now, 20 years later, I wish I was only forty. I often wonder these days, with more of my life behind me than ahead—although none of us knows the length of our days—how time passed this quickly. How can it be that I am an empty nester, now a new grandma? Where did the years go? When I look at myself in the mirror, I see the crow’s feet lines around my eyes, the sagging chin line, the creases etched deep into my skin. I see the graying hair, the added pounds, feel the aches in my back and hip. And, most recently, when my husband and I met with our financial advisor, we thought about retirement. How much money will we need to survive? Will we have enough? What do we envision for our retirement? How did we get this old? By living, obviously. We are at the top end of the sandwich generation with a son about to graduate from college and parents in their eighties. Financial concerns thread through all three generations. A dear aunt sent me a letter the other day. The golden years, she wrote, are not so golden. She then listed her husband’s health woes. I wish I could make things better for her and my uncle. I wish, too, that I could bring back my friend’s husband who died of a heart attack five weeks ago at age 59. I wish my mom would be the same mom I remember before she face planted in the floor of her assisted living apartment breaking her neck and suffering a concussion some two-plus years ago. But I can’t change these things. I can’t change aging. But I can choose to handle aging with some sense of grace and gratitude that I get to be old. Tell me, how are you handling aging? WAITING AT A STOPLIGHT along Cedar Avenue in Apple Valley, I noticed apple-shaped street-side signs. That prompted me to wonder about this south metro community’s name and history. Mostly, I connect Apple Valley with the location of the Minnesota Zoo. And an Original Mattress Factory store; a brother-in-law is an OMF vice president. But what about those apples? According to the city website, a builder named several of his plats Apple Valley and then planted an apple tree on each home site in some of his new developments. What a great idea. That was in the early 1960s. In 1968, residents voted to incorporate the Township of Lebanon as the Village of Apple Valley. As cities go, Apple Valley is relatively young. I’ve mostly lumped it with other south metro communities like Lakeville and Burnsville. Maybe it’s time to take a closer look, to explore beyond the few businesses I’ve occasionally shopped along and off busy Cedar Avenue. Does Apple Valley have an established downtown? What am I missing that would be worth seeing? The Visit Apple Valley website uses these words (matched with photos) to describe an Apple Valley experience: serenity, luxury, ahhhhhhh, relaxation, play, indulge. 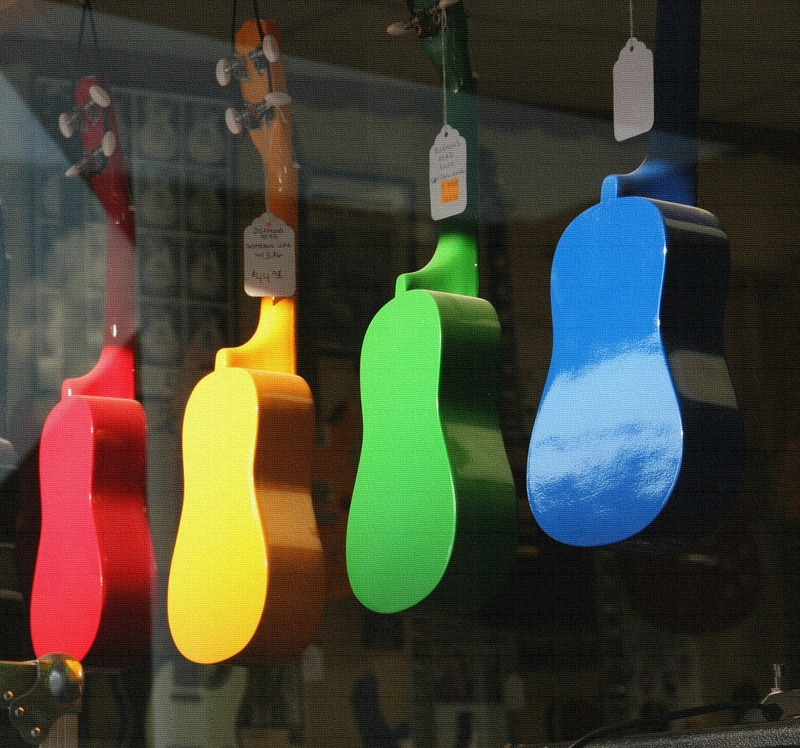 A row of vibrant ukuleles are suspended in the front window of Eastman Music in historic downtown Faribault, Minnesota. I REMEMBER PLAYING a ukulele in junior high school. I had no clue what I was doing; I could not read a musical note. Somehow, though, I managed to strum my way through a concert and pass a music class. Interesting how I remember that all these decades later. And interesting how the teacher failed to notice that I was not learning to read notes under his instruction. Unlike nearly every other student, I never had the opportunity to play piano or a band instrument. I was the second oldest of six children in a poor farm family. There was no extra money for music anything. Plus, my elementary school didn’t offer a band program and the junior high school, at 20 miles distant, was too far away for me to be involved in band. I’ve always regretted not being able to read music or play an instrument. I cherished the toy accordion I received one year for Christmas. It is the closest I’ve ever come to owning a musical instrument. When my sister, three years my junior, took flute lessons, I taught myself to play “Mary Had a Little Lamb.” Yes, my parents somehow scrimped money for musical instruments for my younger siblings. How about you? Can you read music? Do you play a musical instrument? If not, why not? NOTE: I took this photo a year ago and just now pulled it from my files.